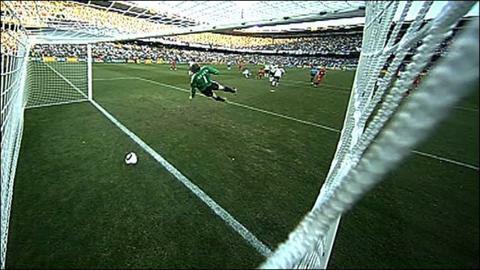 Goal-line technology will be introduced in the Premier League next season. The technology was successfully trialled by Fifa at the 2012 Club World Cup and the Premier League says it is in advanced talks with two unnamed providers. "We're working on the basis of having goal-line technology in place for the start of the season," said Premier League spokesman Dan Johnson. "All clubs will have to have the system, including those promoted." Hawk-Eye and GoalRef were both used at last year's Club World Cup, but the Premier League has not named the companies it is in talks with. League chiefs say they will choose a system based on cost and how easy the system is to implement and use. Johnson added that Premier League clubs would not be able to opt out of using goal-line technology but insisted the system would not be too expensive for the 20 teams. Fifa has already said it plans to use the technology at the 2014 World Cup in Brazil. A meeting of the International Football Association Board (IFAB), the game's law-making body, in Edinburgh on Saturday will be told the first use of the technology was a resounding success. That report will be the final green light needed for the systems to be used in professional leagues.